[.02] Strokeit NOT working after 4.02 upgrade. HELP! in sandboxie.ini under default sandboxie with no success. I've fiddled and googled for over an hour and finally reverted back to 3.76. Strokeit works perfect in this version. I like the newest version 4.02, b/c it seems snappier with browsers, but I CANNOT live without Strokeit(have too many settings set up). Is there a solution? is sandboxie not going to be compatible with Strokeit even in the future?????? I'm afraid that you're right that StrokeIt is not compatible with version 4.02, and I will try to improve this in the next version. Which I believe the new template for strokeit for the software compatibility of SB 4.02 does by default. This has gotten strokeit to work on most but not all my sandboxed applications on win7 64bit. Does strokeIt not work on all sandboxed applications or just some? Can you try opening a sandboxed notepad and try a gesture on that. Also, I am having some problems with strokeit myself and would like to know if you are running strokeIT with admin privileges? Since you will not be using OpenWinClass=# which tells sandboxie not to modify the window class name. 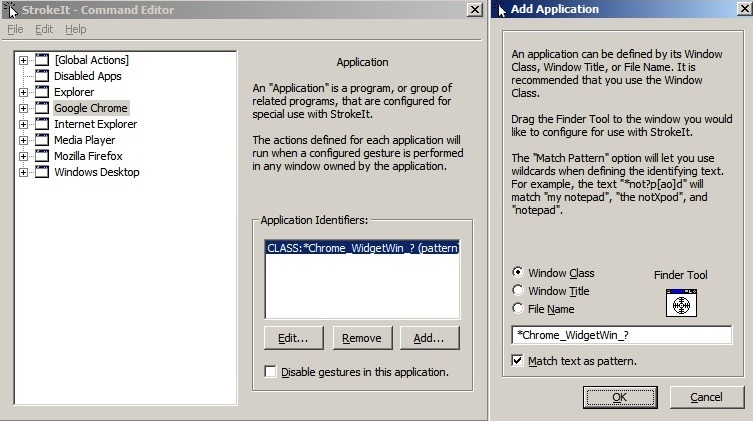 You will need to edit you strokeit configuration for window classes to use a pattern based match to recognize these sandboxed windows. I use: *Chrome_WidgetWin_? as sometimes the number changes. I deleted OpenWinClass=#... then in Strokit, under Add Application, I checked Window Class, then using Finder Tool I clicked on IE10. I'm mainly trying to get sandboxie to work with IE10. the Finder Tool found: "Sandbox:DefaultBox:IEFrame"
I checked "Match text as pattern"
tzuk wrote: Please check version 4.03.01.
highly appreciate your hard work! But the issue between Strokeit and Maxthon4.x has not been resolved. Please check in your spare time. In version 3.76 I ran StrokeIT as administrator so that it can interact with process explorer, computer management, etc, and this never had any issues on sandboxed applications. Now, with version 4.03.01, StrokeIT running without elevated privileges, continue to work with chrome, but still have popups for GUIPROXY_00000001 Error. Other than that it seems to function fine. So now I test StrokeIT launch as admin as this is how ideally I would like it to run, but just like 4.02, it doesn't register the stroke it blue line / gestures in chrome. In fact, now it doesn't work on any sandbox applications, while in 4.02 it worked on every sandboxed application but chrome. And then I test Stroke launch as admin and also with OpenWinClass=*, now it works on all sandboxed and unsanboxed applications, however I would have to add OpenWinClass to each sandbox which will decrease security quite a bit. Also, I would like to note that with OpenWinClass=* the GUIPROXY_00000001 Error dissappeared. Just wanted to report my finding and let you know that StrokeIt functions differently depending on how its launched. I would appreciate it if you can get it to work when launched elevated as admin without having to resort to OpenWinClass=*. By the way, when relaunching strokeIt as admin, you must first Shutdown strokeIt via the File Menu in the program, so it will properly unload the DLL's files or whatnot. If strokeIt isn't shutdown this way then A/B testing admin/non-admin won't differ. Thanks for the detailed explanation, I can reproduce all the problems here and in the other topic, I believe I will be able to address these in the next beta version 4.03.02.
tzuk wrote: Version 4.03.02 should fix the remaining issues with StrokeIt. Thanks for your work. Maxthon can work very well in SBie 4.03.02 with template of StrokeIt. Works great. Thanks so much. Version 4.03.02 WORKS GREAT! THANKS!!!! !